Rod Renton is an agent with the Missile Defense Systems. The MDS is a British intelligence agency, almost certainly connected to the military. We learn very little about the organization except through conjecture. It is obviously large enough to be able to have resident agents in many major cities around the world and it is funded well enough to give its agents some pretty interesting and impressive toys with which to play. It is referred to as being "secret" though it is not known whether that means its existence is kept quiet or just that not much is known about it is not disclosed. Renton is said to be the MDS's best agent, especially when partnered with the junior but still very capable Mac Malloy. Renton is definitely the man in charge but he trusts and relies on Malloy enough to show that Malloy could easily have led his own team though Malloy is refered to in both recorded adventures as his assistant. Both Renton and Malloy are trained pilots, able to handle both winged and rotor machines. They are crack shots and not at all shabby at hand-to-hand combat. In keeping with the requirements of being an agent in the 60s, Renton has an arsenal of very nifty "secret" devices which he is able to produce when the going get tough. If nothing is at hand, his hands can work wonders at opening locks and closing mouths. The fact that the two cases we know about deal with the Middle East and the Far East shows that Renton is an international traveller, sent anywhere in the world there is trouble but especially when the evil forces of the "East" are getting frisky and endangering the interests of the "West". In the mid-60s, the successful British publishing house of Wm Collins Sons added to their imprints the small-sized paperback "Spitfire" books. Measuring a diminutive 5" x 3.5" they were roughly halfway between Whitman's Big Little Books and normal sized paperbacks. Since the font size was standard, each page was half of what a regular book would have and with the books running just 120+ pages, each story was more a novella than a book. This made it a good fit for young readers. A third Basil Deakin book in the Spitfire format, Secret of Zarb, was released at the same time and looks to be similar to the two Rod Renton books but was about a different pair of agents, Greg Grayson and Steve Stanton who work for an organization named W.A.S.P. 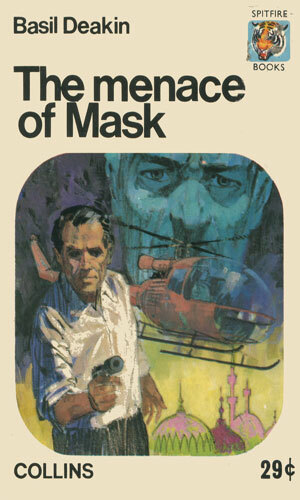 The MDS undercover agent in Egypt sends word that a mysterious and dangerous person known as Mask is up to no good. Then the agent disappears. Rod Renton and his pal Mat Malloy are sent to find and stop whatever is going on. 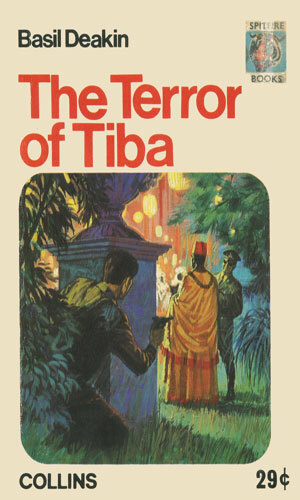 The interest of Britain in the Far East are being threatened by activity on the island of Tiba and Rod Renton, back by Mat Malloy, is sent to that nation to discover who is behind the subversive activity. If I were a young boy, say around 11-12, I would have really liked these books and since that was the target audience, I would say they hit their mark. As an adult, they are mildly, albeit rapid, entertainment. There is almost no character development so it was a dickens of a time to find enough to write anything about Rod Renton. Still, the youngster reading the tales would have wanted adventure and excitement and not cared a whit about motivation or personal history so me carping about it is silly. I should have just enjoyed the stories channeling my inner-kid, an entity my wife says is not that 'inner'.